Young Dolph is in the final round of his #MajorChallenge which he launched last October. The final winner will be gifted $30k cash OR Dolph’s personal, custom-wrapped camouflage Hellcat. Aside from it being the signature camo featured in all his recent music videos, he also exclusively commissioned for himself — To enter, contestants upload a creative video they create with “Major” as the soundtrack to Instagram using #MajorChallenge. Fans will vote for the winner based on view count and originality. Check it out below! 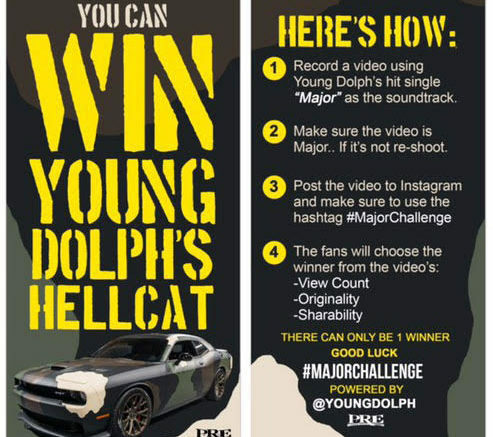 Be the first to comment on "Video: Enter to WIN Young Dolph’s Dodge Hellcat #MajorChallenge"